Walking trips – plus – anything else that takes my fancy! The Alta Via 9 is one of 10 long distance paths crossing the Dolomites. It is unique in that is the only route travelling West-East – the other 9 routes travel North-South. It does, therefore, cross many of the other routes, so there are possibilities to combine paths. It is a relatively easy trek – with the only difficult stretch being the Strada degli Alpini – a via ferrata route; however, in the event of bad weather or other difficulties, this can be bypassed (as unfortunately we were to discover). The trek is 180 km in length and we split it into 10 day sections (it would easily be possible to produce some shorter days by extending the duration of the trip). It is worth noting that unlike the more popular Alta Via treks I have done, this one is not marked as such anywhere on the route – there a few parts – notably from Rifugio Alberto Popera – where the path is faint and unmarked and care needs to be taken. There is a guide book to the route – in German – “Dolomiten Hohenwege 8-10” by Franz Hauleitner – published by Berverlag Rother. DAY 1: We started in Bolzano – having arrived there from Innsbruck by train. At the bus station we bought our tickets and were told by the person on the desk that we could catch a different bus to the one we had planned to Tiers – at an earlier time. This seemed great until we realised we were sitting on a bus going in the wrong direction up the wrong valley! Getting off at a suitable point, Allan and Byron managed to work out that by catching a bus later, running in another direction, we could get off and walk along a path to join the route from Tiers. It worked! Thanks guys! We arrived at the walk start just after 5pm with a 2-3 hour walk and a 1000m climb to our overnight stop – Rifugio Bergamo -in prospect – so it was necessary to push ourselves! Shame really – that we hadn’t more time to enjoy the walk – as scenically it was superb. Initially, the path went through beautiful meadows and then alongside a stream in charming coniferous forest. As we climbed out of the trees the path crossed a ravine and threaded its way alongside rocky pinnacles and towers ablaze with the colours of the setting sun. Arriving at the hut we found we were late for dinner so we had to wait until everyone else had finished and were forced to drink beer instead! 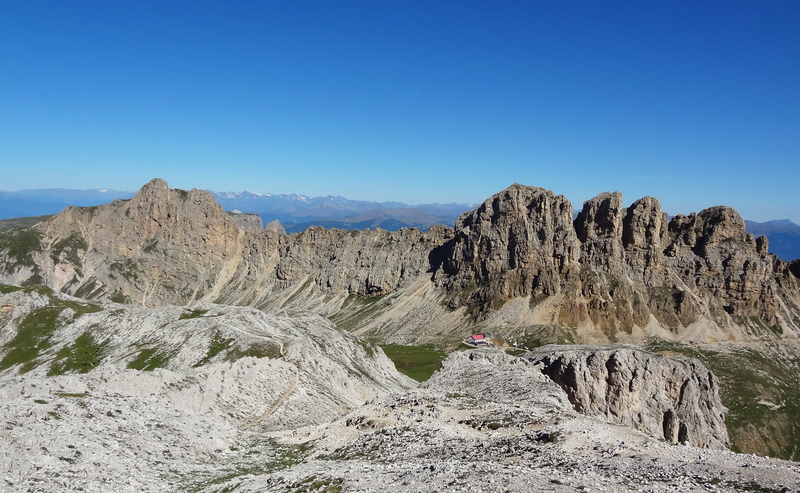 DAY 2: Our second day (but first proper day of walking) was to take us to Passo Sella – about 4 hours walking time. It was a cool and crisp start- which meant that visibility was unusually good. Quite quickly the path rises steeply to the southern Molignon pass, through a rocky gully and onto a plateau – here there were fantastic views of the Rifugio Alpe di’ Tires directly in front of us with the Denti di Terrarossa, the Cima Terra Rossa and the snow capped Central Alps in the far distance. Reaching the Rifugio there followed a magnificent and easy high level walk along the Suisi ridge – the Friedrich August Weg – with constant views into the mountain world of the Gardena and Fassa valleys. This was incredibly busy with day trippers – owing, no doubt, to the close proximity of several car parks! We reached the Rifugio Sasso Piatto -at the foot of Sasso Piatto with views of the Zillertal and Stubai Alps in Austria in the far distance – at lunchtime. I can’t remember seeing so many people in one small place at the same time before. Moving quickly on the path continues as the Friedrich August Weg along the southern slopes of the Sasso Lungo massif. impressive view of the Marmolada – the Dolomites highest peak to the front of us. After an hour and a half we arrived at the Passo Sella – plenty of accommodation available here for the overnight stop. DAY 3: Today’s walk would take us onto the enormous Sella Plateau – a walk of about 6.5 hours in total. The entrance to it is through Val Lasties and an impressive canyon flanked by vertical walls. Increasingly steep, the heat of midday made it a tiring ascent (over 900m). Emerging at last onto the plateau an amazing sight awaited us. This vast, barren, flat expanse of rock is incredible – you could imagine you were on the planet of Mars or somewhere equally inhospitable. Rocks and markers point the way across this vast plateau. Climbing to the summit of the Antersass- 2907m- there was an incredible view north east into the canyon of the Val de Mesdi and the tooth like Dent de Mesdi on the left – with the Zillertal in the far distance – one of the classic views of the Dolomites and a feature of many a postcard! We then descended gently to reach the Rifugio Boe late lunch time. The refugio was packed with people(owing to the nearby cablecar) and we squeezed ourselves into a corner to enjoy a beer. With the time of the last cable car down looming,the crowds eventually disappeared and we were left with just a few others to spend the night there. DAY 4: Today was meant to be a 4 hour walk (to Rifugio Passo Valporola) but as things turned out it was more eventful and longer! We left the hut early after breakfast and made our way up to the summit of Piz Boe (3152m). On the top there is a tiny refuge – the Capanna Fassa. 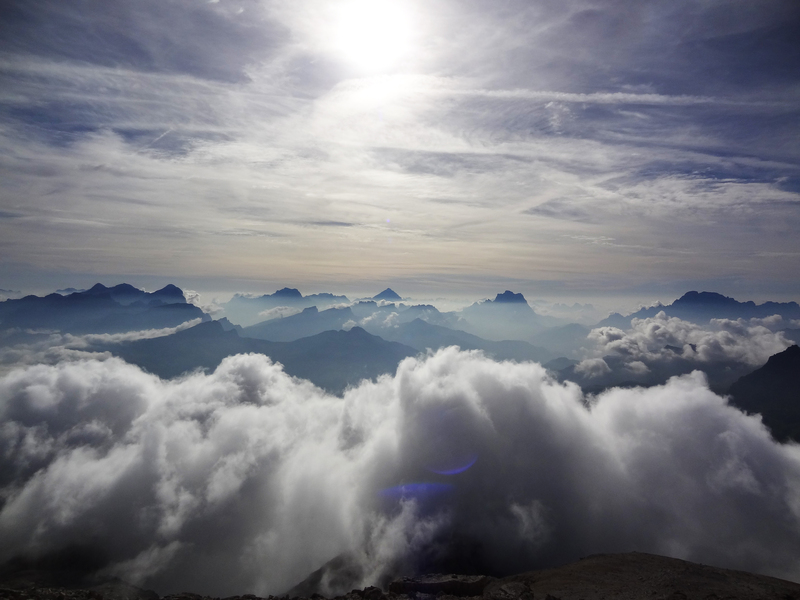 There is an absolutely brilliant panorama of much of the Dolomites from here, made all the more atmospheric by rising clouds from the valleys all around us – and an approaching depression! To the south, the Marmolada, further right the Latemar and Catinaccio. The the west, the Ortler and Sasso Lungo. To the North, in the far distance the Zillertal Alps. Tothe right, Tofana, Sorapis, Marmarole, Antelao and Pelmo. Difficult to take all this in! Dropping down from the summit, the cloud coming up from the valley base quickly enveloped us. Unfortunately Laurence and myself in front, became separated from the rest and we were not to meet up again until arriving at Rifugio Passo Valporola 5 hours later at the end of the day. We dropped down through a delightful rocky valley to arrive at a chairlift station. Not being a fan of walking down ski slopes we caught the lift which speedily took us down to the road at Passo di Campolongo. By now the sun was out – though it was clear from the cloud types that rain would be on its way. The next few hours are in between mountain ranges – so much of the walk was through grassy open meadows – to Rifugio Pralongia. The refuge was busy serving lunches – thanks to the wonders of mobile phones we were able to check with the others to ensure everything was OK. In front of us now was the imposing dolomitic mass of Settass. The route had to get round this – the map shows two ways – we followed the shorter, northern, better marked route. It turned out be be a lovely route – through meadows and pine woods. There is an increasingly amount of evidence of war positions as you approach the pass. Thunder could be heard occasionally and the black clouds all around us looked ominous. Moving quickly we reached the pass and hurried into the refuge – our overnight stop. As we ordered beer and cakes torrential rain could be heard outside. Unfortunately as the rest of our group was about an hour behind us they caught the full force of this and eventually arrived drenched! DAY 5: Today’s route would take us via Rifugio Lagazuoi to Rifugio Pomedes – a five hour walk. After the rain, there was a cloud inversion in the valley – which quickly cleared. The visibility was superb, after yesterday’s humidity. Although we could have walked, the path seemed to follow the line of the cable car to Rifugio Lagazuoi – so we took that instead. This meant we had plenty of time there to relax, enjoy the views from the sun terrace and walk to the nearby summit. At the top of Passo Valporola there is an impressive building – the Tre Sassi fort. This was built in 1897 to defend the southern confines of the Austro Hungarian Empire. After only a few weeks of war the fortress was hit, being damaged from bombs fired from the nearby Italian fortress at Cinque Torri and was then evacuated. Today the fortress is a museum displaying memorabilia from the Great War. There is a vast area of Great War tunnels and fortifications at the top of Lagazuoi. 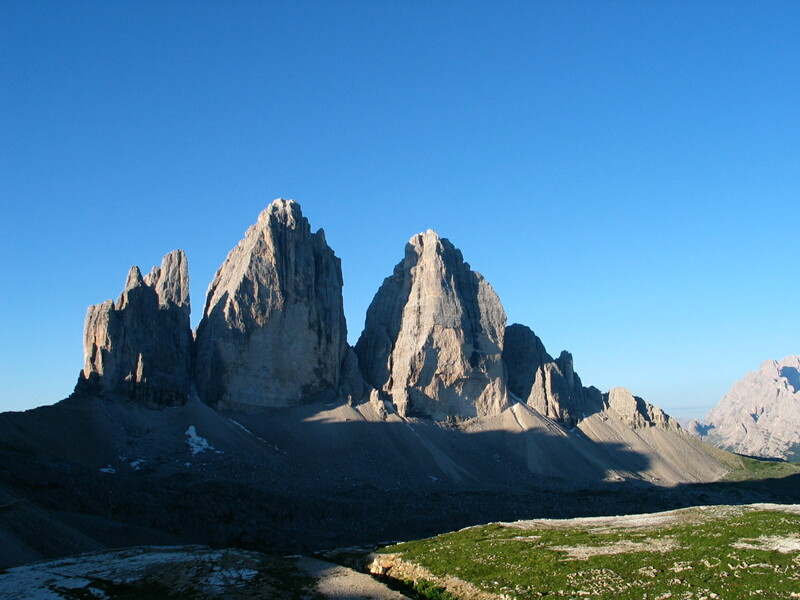 During the First World War the Austrians and the Italians fought over and inside Mount Lagazuoi in the Dolomites. Both sides dug a network of tunnels inside the mountain with the aim of planting mines beneath their enemies. Some of the tunnels they dug have been restored and you can walk down inside the mountain through the tunnel system. 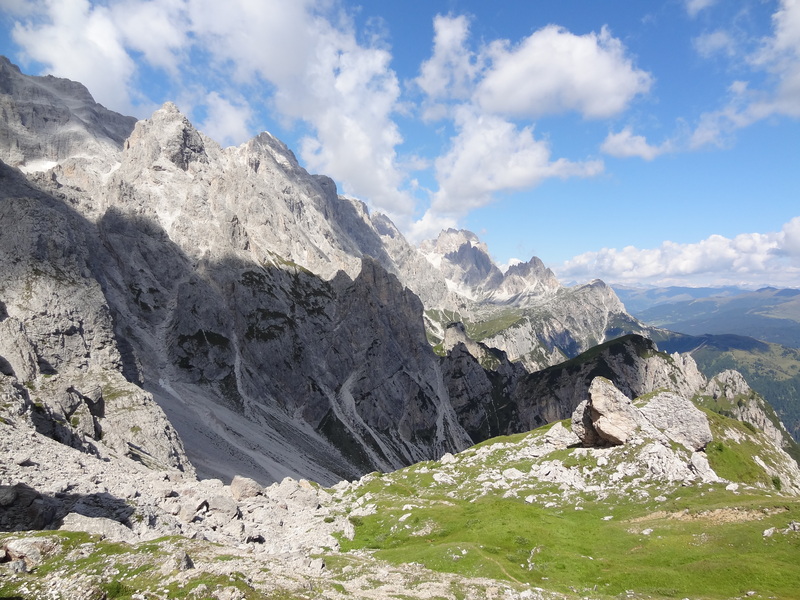 Fantastic views from here on the Civetta, Pelmo and Tofana and so many other famous Dolomites peaks; especially rewarding was the chance to look back over the whole of our route covered so far. Leaving the refuge there follows a fantastic route for about two hours right under the south walls of Tofana – the Senterio Astaldi – past several areas of war remnants. At one point, we had to leave the Senterio as the path had been swept away – descending right down to Rifugio Dibona – at this point we were able to find another path rising up a steep wall and rejoining the final part of the path to Rifugio Pomedes. 2280m. This is a nice refuge standing on a high shoulder of Punta Anna overlooking the Cortina valley and the rock giants of Cadore. We were the only people staying overnight – despite it still being August. Day 7: We awoke to discover it was still gloomy and unpromising outside – the cloud base was much lower than the refuge – and it was raining intermittently. Today’s walk was a long one – though apparently “not arduous”. We had a decision to make – walk the whole way or cut out the beginning using cable car and bus. In view of the weather the latter option seemed preferable. We caught the first chairlift down from the refuge and then the local bus to the village of Misurina (the walking route basically follows this line of direction, but at a high level). We arrived in Misurina and had elevenses and then lunch! Misurina lies at the end of Lago Misurina and has a few tacky shops, some hotels and not much else to recommend it. Our book rubbed salt into the wounds for much of this day – with constant references to “marvellous views” – we saw nothing! Our walk continued from the village upwards to reach Rifugio Fratelli Fondo Savio 2367m – an interesting rocky route with three iron ladders to negotiate before finally emerging at the refuge itself. We were lucky to walk in the dry as shortly after we arrived at the small but very friendly rifugio, there was a heavy downpour of rain. Day 8: Another gloomy day – hence the lack of photographs for this part of the trip. This was a real disappointment as the trek for the day went through exceptional Dolomites scenery. The first part, (made longer by initially taking the wrong path and then having to retrace our steps), is the Senterio Alberto Bonacossa. This great route, protected in places, crosses a series of vertical walls and follows several wartime paths. In the middle section, after an exposed traverse, the path leads upwards into a dark triangle formed by overhanging walls. You follow it on wire ropes, then up a 40m iron ladder suspended from a higher ledge – interesting in any weather I guess, but extremely wet, cold and slippy when we did it. Eventually the path comes out on a col where there are wonderful views of the iconic Tre Cime – we could only see the bases of these as the cloud base was so low. This was all very different from when I came here a few years ago in winter – the weather was perfect then. Descending down over pastures we arrived at the crowded Rifugio Auronzo – for coffee and cakes. With 5 more hours of walking ahead of us we needed to press on. 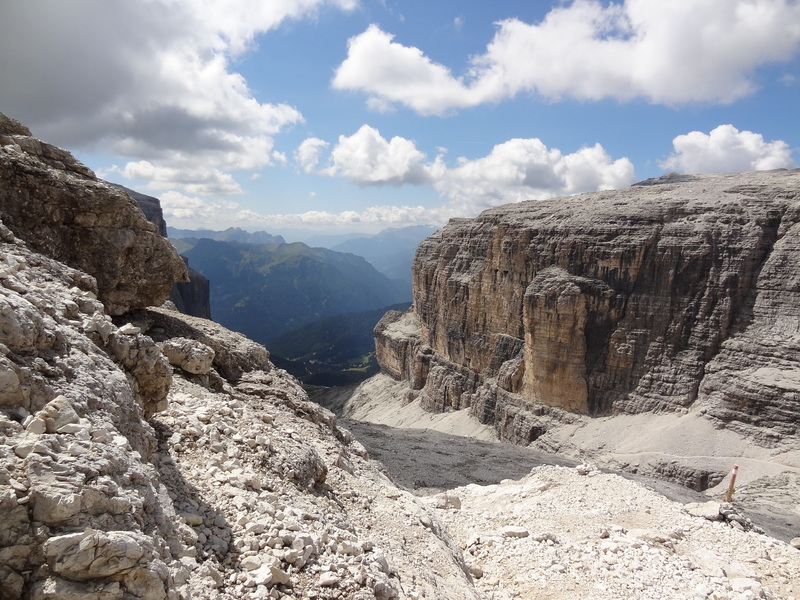 The book says “the crossing of the Sesto Dolomites can be regarded as the culmination and high point of the traverse”……”wonderful, high level walking…….fantastic mountain scenery”. Poor visibility really did spoil the experience and sadly it became more a case of getting from Point A to B. 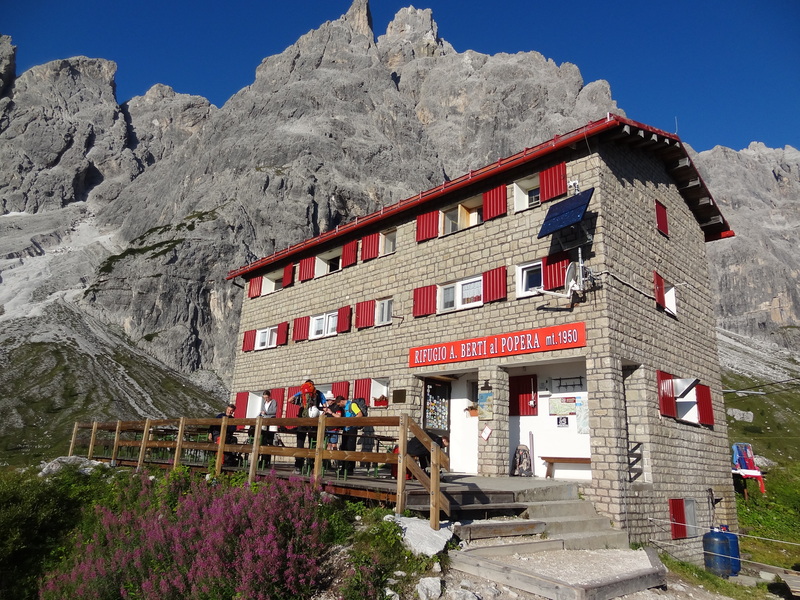 We eventually arrived at Rifugio Carducci – our stop for the night. Day 9: More rain and a considerable drop in temperature meant that by morning some snow had fallen. We now had a real dilemma. Today’s route was to be the most difficult part of the route – the protected route Strada dei Alpini. This was established by Italian soldiers during the Dolomites War 1915 – 1918 and it travels round the west and north faces of Cima udici. The book says “surefootedness, freedom from vertigo and climbing ability required – special caution required around the north flank of Udici, often snow covered or frozen (self belay,ice axe and crampons recommended”. With the overnight snow and no ice axes or crampons with us, we had to decide whether to try the route or not. In the end most of the party decided to end the route here and descended to the valley for a bus to Santo Stefano di Cadore. Myself and Laurence decided to continue the route to the end – but avoid the Strada dei Alpini by taking a variant which required dropping initially down to the Rifugio Zsigmondy Comici 2224m and then to the Sasso Vecchio valley on a striking rocky ledge to reach our coffee stop – the Capanna Turistica – where we had coffee and a cake – sitting outside in the warm sunshine – blue skies up above. Had we made a mistake? Well it was too late now to go back – so we had to make the most of this alternative route. As it turned out, I thought it was an enjoyable day – although much longer than it had been planned to be. From this stop the route came out in beautiful meadows in the Fiscalina valley. Now passing through a forest and under a chairlift we came out at the Rifugio Rudi – where we had lunch. The path then follows under the North faces of Croda Rossa, Monte Castelliere and Pala di Popera, before joining an old military road. The approach to the refuge was exciting – it seemed difficult to see how we were going to reach it as the Crestone di Popera seemed to obsrruct our passage. As always,an ingenious path led upwards over it involving a considerable degree of effort and care to arrive at the refuge for about 5pm. There were a couple of people there -who did not look the hardened mountaineering types- that had come over the Strada dei Alpini that day – so on reflection, I guess, we could have also completed it. Refuge Popera is an interesting place – situated in a fantastic spot, it has a big collection of World War 1 memorabilia – and it was also visited by Pope John Paul II – as many photographs and an outside plaque testify. Day 10: The final day of the route! Glorious weather greeted us – on a route which is undeveloped and seldom visited. The trek to Bivacco Piovan is superb – fantastic scenery throughout – we met no-one. The route from here proved to be incredibly tiring – a series of walks up to cols immediately followed by descents losing all the height previously gained! The fine wild scenery and the sense of being somewhere special took away the pain. Care does need to be taken on this day as the path is faint and infrequently marked – not a route for poor visibility. Eventually we dropped for what seemed an enormous amount of time to meet a jeep track through the forest ,eventually joining a road by an Albergo (Sant’Antonio) which was closed and falling into disrepair. Not far now! A dreary walk down a road took us into Danta di Cadore where we found a small bar – time for a beer here whilst we waited for a bus to take us into Santo Stefano di Cadore to our hotel and a reunion with the others.